Is it time to Survey your audience? Are you creating content without knowing if it is what they really want? 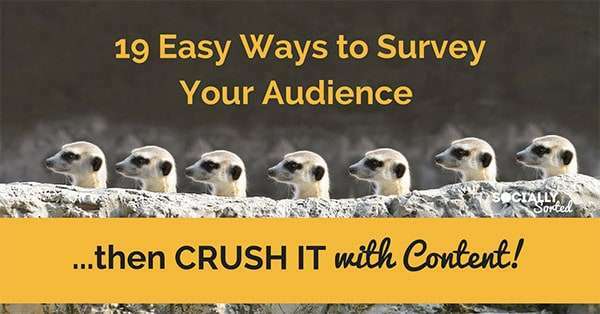 In this post, I share 19 Ways to Survey Your Audience … so you can Crush it with Content that catches attention and converts! Hint: Some of these strategies are super simple, and you can do them right NOW! I’ve been there… and I am sure you have too. Somewhere along the way you forgot to actually ASK what people wanted. You forgot to survey your audience. Or better still, you forgot to ask what they don’t want. Oh yes….we talk about what we don’t want, even more than we talk about what we want. Asking your audience for that extra “intel” can make the difference between a piece of killer content or a piece of content that crashes and burns. So here are 21 Ways to Survey Your Audience. Survey Your Audience with a List. If you have a list of subscribers, then you are off and racing. If you don’t, it’s ok – there are plenty of options you can still use. Survey Your Audience via Social Media. If you are just getting started (or even if you have a list) you can easily survey your ideal audience using social media. I’ve listed out plenty of ideas. Survey Your Audience without a Social Media Following (or a List). All is not lost if this is your starting point. In fact, you are probably in a GREAT position as you can do this the right way, building your list in a targeted way at the same time. #Winning. Let’s start with a list or subscriber community. This is the logical place to start, as the people that handed over their email address are already invested in your content… so they are the right people to survey. 1 Ask your subscribers a survey question via email. Send a simple email to your subscribers and ask them to answer just one question. It doesn’t have to be complicated.. just ask them to hit reply and tell you what their biggest challenge about X is. When it comes to _____ what’s your biggest challenge. What is your biggest __________ challenge. If you could solve one thing about _______, what would that one thing be. The more you can narrow them down to “one thing” the easier it is to see what the main topics/problems are. Look for primary “groups” of concern and think about how your content can be tailored to meet those needs. ie answer their questions or solve their challenge with content that helps them with it! This is where you get a little more serious about surveying your audience. Ask them a few basic questions along with the “challenge” question. However, instead of using a simple email reply, you create an actual survey or quiz using software. Popular software choices for doing this are Survey Monkey, Pop Survey, Typeform, and Survey Gizmo. These software platforms are fun to use. You can also use Google Forms for a basic survey. Even at its very basic, using one of these tools will help guide you through the steps necessary to conduct a survey or quiz… as they are all very user-friendly. If you want to get more information about how to run a survey (and take it further with some serious survey strategy) then I highly recommend you read this book: Ask. by Ryan Levesque. It’s free (+ shipping). 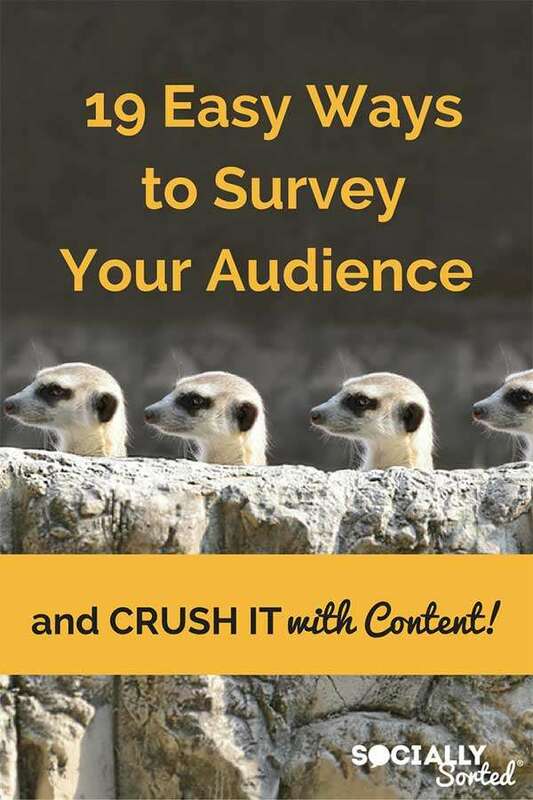 The book takes you step-by-step through how to conduct a survey that gives you the best information about your audience challenges and determine what content or training would be a good fit for them. 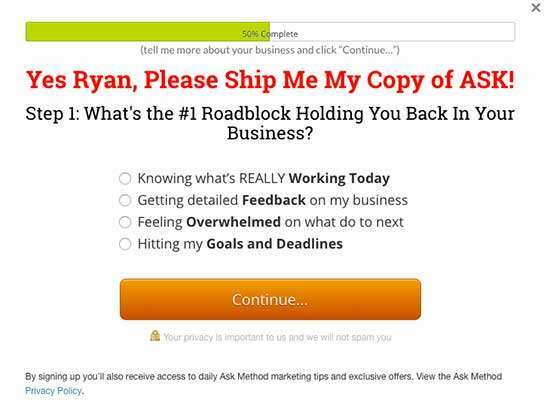 I couldn’t possibly explain it better than the author, Ryan Levesque, so go grab the book or listen to this great interview with Ryan on Pat Flynn’s Podcast. The more questions you ask the more drop off will be, so ask the important questions and keep it simple to start with – you want to know their biggest challenge but you might also want to know an age/demographic/business category question. ask for their phone number or email but make it optional. Being able to talk to those people that send detailed responses really helps (hint: they are your ideal customer). Use surveys to segment people into areas of interest that you can then target with email marketing. If you don’t have time to do full-blown survey, there are many other ways you can survey your audience, so keep reading. 4 Segment your subscribers when they opt in. If you have an email service provider that allows you to put people into different lists, then asking a simple question when someone opts in to get emails from you can be a great idea. Once you have this information you can better tailor your emails (and content or even training programs) for those people. Another way to do it is to simply send an email to a new subscriber asking them to click on a choice of two or 3 “challenges” or problems. Or you can ask them once they subscribe and then start segmenting people based on their area of need. 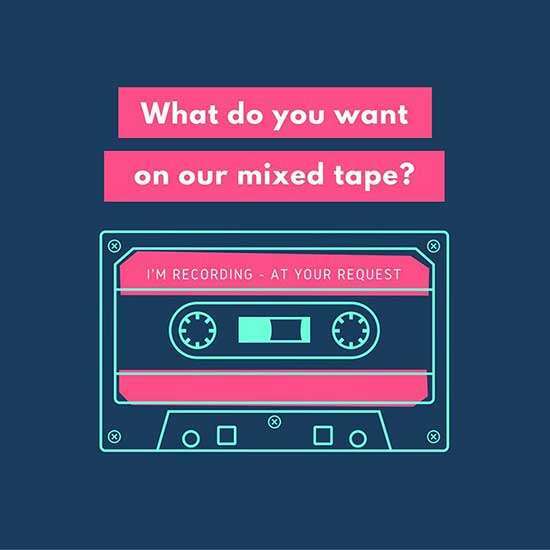 So now you have some ideas for conducting surveys (basic and advanced) using software and email marketing, what about some more simple methods? Jump on to a Facebook Live on you Facebook Page or Group (if it’s your group then you’ll need to check the rules as many groups do not allow live broadcasts). Start talking to your audience. Ask them about their challenges. Ask them to post their biggest challenges/hurdles in the comments while you are broadcasting. You’ll have a summary of their biggest challenges ready for you, the minute you get off the broadcast! Create an image using a visual content tool, and post it up on your page or in your group (if the group is not yours, please only do this if the group rules allow it). Make sure you add an eye-catching title and let people know you want them to answer a question or give their opinion. Add extra information or links to the description. This one simple question gave me valuable information about the needs of my program members. If you know the the probable answers or main “buckets” of challenges that your audience have identified, this will help you find out which one is the most common or biggest challenge. Ask them a simple multiple choice question – ie Which is your biggest challenge, A, B or C? You could also add an image to make it pop like I discussed in #6 above. It’s a little harder to ask questions and get responses on Pinterest but you can definitely tease people back to your blog or social media or survey landing page. Create an image and pin it with the link back to your survey location. If your survey is on a blog post (see #12) then include a pin-worthy image on that post so visitors can pin the image. If you are a member of a relevant group on LinkedIn, ask the question in that group. If you pick the right group, it’s a fast track to reading the brains of your ideal audience! This is super easy to do. 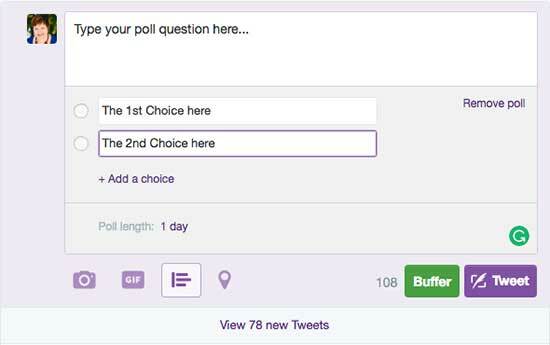 Just click the “Poll” icon when you are ready to create a tweet. 12 Write a blog post and ask for feedback or embed a survey into the blog post. When running a full-blown survey, a great strategy is to write a dedicated blog post about it and include the link to the survey in the blog post. Or, if you want to keep it simple, write a blog post and ask your readers to reply and answer the survey question in the comments. If you want to catch attention on Linkedin, take that blog post and re-purpose it into a LinkedIn article. A great way to encourage people to respond to you is to create a video. Your community is more likely to respond and engage if they see your face. So, create a short video and post it on your Facebook Page or Facebook Group. You can also create the video on YouTube and then repurpose it for Facebook (it’s always best if you upload it natively there). Bonus points if you take the same video and turn it into a Facebook Ad. 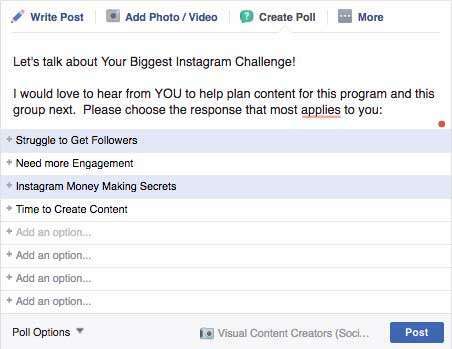 There are plenty of options on Instagram to ask your audience about their biggest challenges or what they need help with. an Instagram Story (where your followers can send you a direct message or comment on a particular post). And of course you can conduct an Instagram Story Poll too! Or direct them back to a blog post or survey link (add the link to your bio!). Just about any of the above strategies can be turned into a Facebook or Instagram Ad – posts or videos. If you want to get loads of responses, consider using ads to get it out there! If you do a full survey, then post that survey link on your social media accounts where your ideal audience hang out. All is not lost if you don’t have a list yet or you haven’t really started to establish yourself on social media. There are some things you can do! If you already have a client that you know is a GREAT client, then call them up and ask if it’s ok if you get their feedback for 10 minutes. If they say yes, then you are in luck. Now you can find out what one of your “ideal” clients struggles with, how you have helped them and what they need help with.. and what inspires them. If you are in a brick and mortar business or you work 1:1 with clients, then take notice of your FAQs. These are the Frequently Asked Questions your clients ask (over and over). These questions (and their answers) reveal very clear challenges that your ideal audience are facing, so consider it a type of survey. If you get asked enough times about something and it makes an FAQ list… write content about that topic! Just because you don’t have a social media following yet or a big list, doesn’t mean you can’t get intel about your ideal audience. Talk to a colleague who has a following or a list that would be similar to your ideal audience. Choose someone you have a good relationship with, as you are asking a favour. Ask if they would be interested in surveying their audience (using your questions) in return for a summary of the results. This way you both win! Consider running Facebook ads even if you don’t have a lot of fans. You can run ads targeting someone else’s Facebook Page or set up an audience that reflects your target marke. Promote a landing page with your survey on it or your survey blog post with the ad. Everyone can get started with Facebook ads. That’s a lot of ways to survey your audience. So no excuses for any of us, hey? Now you can easily survey your audience … and then use what you know to crush it with your content. Once you know the 3-5 primary challenges faced by your ideal audience, you can set about creating content that answers their questions and helps them overcome the problems they have identified. Have you surveyed your audience lately? Which of these 19 Ways to Survey Your Audience will you use to check that you are creating content that truly resonates with them. Leave a comment below (or let me know if you have any other tips!). Leave a comment below (or let me know if you have any other tips! ).